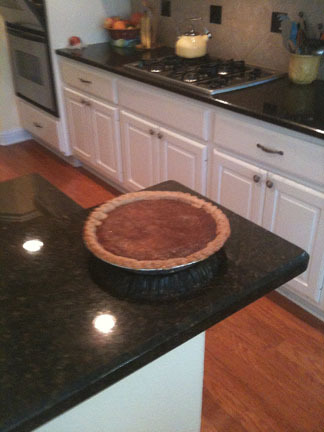 This pie recipe is from About.com and is attributed to Linda Larsen. It’s a cookie! It’s a pie! Pre-heat oven to 325 degrees F. Beat eggs well in large bowl. Add flour and sugars and mix until well blended. Stir in the melted butter. Add chips . Pour into unbaked pie shell, and bake at 325F for 55-65 minutes until puffy and golden brown. Let cool at least two hours before cutting. It’s currently on a rack in my kitchen cooling. I’m ready to eat and have whip cream and ice cream to add. Go big. I love me some cookie pie! This entry was posted in Cookie Pies and tagged Baking, chocolate chips, cookie, Dessert, Pie, Recipe by pieofthebeholder. Bookmark the permalink. I’m too lazy to count. Did you finish your 52-pies-in-52-weeks challenge? I enjoyed reading the recipes and looking at the pies, but I especially liked your commentaries at the beginning and end of each post. Maybe now you can do a retrospective about which pies were best and expand on your stories? Great job. I’m very impressed with your industry! Will you be doing another challenge? Cookies seem the way to go … in my opinion, anyway. Or you could switch it up and do a gardening blog. Plant a rose bush a week? Great blog.